Available in Mirage or Kodra nylon finishes. It's actually almost too small for the stinger. Almost. Takes a little stretching, but eventually works well. The flashlight fits and works great. Fits my belt, and holds and protects my flashlight perfectly. What is the length of this holder? Dimensions of holder will vary depending on the flashlight. 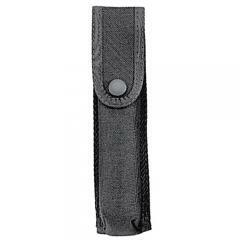 Best way to figure out if the case fits your light is to compare the specs of the listed flashlight to the flashlight that you plan to use in this holder.